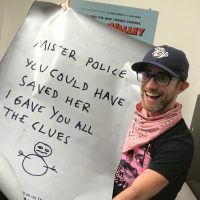 Want Further Proof That Jessica Harper Is The Best? Check Out Her Cookbook | Birth.Movies.Death. Luca Guadagnino’s Suspiria, his reimagining/transmutation of the story originally told in Dario Argento’s legendary 1977 horror film of the same name, is shaping up to be one of the capital letters BIG DEAL movies. It’s Guadagnino’s fourth collaboration with Tilda Swinton, and she’s playing multiple roles, one of which exists outside the text of the film itself. As Dr. Lutz Ebersdorf, a psychoanalyst turned first time actor who Guadagnino hired to play Dr. Josef Klemperer, Swinton plays the only major male character in Suspiria’s ensemble. It’s the first time Thom Yorke of Radiohead has composed the score for a movie. It’s Guadagnino’s follow-up to 2017’s Call Me by Your Name, which was showered with laurels the world over. And it’s Jessica Harper’s first film role in 16 years. Harper, the star of Argento’s Suspiria, appears in Guadagnino’s film in a small but key part. Like Mark Hamill and the late Carrie Fisher, Harper is best known amongst film fans for her work in the late 1970s and early 1980s. Hamill and Fisher had Star Wars, Harper had Brian De Palma’s science fiction horror musical Phantom of the Opera/Faust adaptation Phantom of the Paradise, the Woody Allen films Love and Death and Stardust Memories and Jim Sharman’s Rocky Horror follow-up Shock Treatment. Further like Hamill and Fisher, Harper is a creative, thoughtful, often incredibly funny, really just all-around delightful person. With Guadagnino’s Suspiria out, now is a prime time to shine a light on Harper and her work, both on film and elsewhere. She may not have appeared on the big screen between Minority Report and Neo-Suspiria, but she’s been busy. She’s recorded music and written books for children. She’s blogged off and on. This month, Harper launches Winnetka, a memoir in the form of a 10-part podcast. 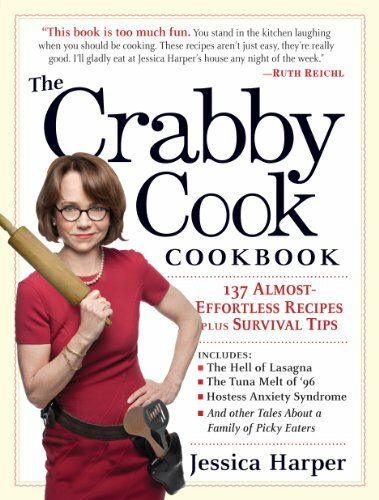 And in 2011, she released The Crabby Cook Cookbook. Though it’s far removed in tone, The Crabby Cook Cookbook (and its attendant YouTube videos, from which this article’s header image is sourced) is as essential for folks interested in Harper and her work as her great turn in Argento’s Suspiria. Even if gorgeous, surreal horror that assails the senses isn’t your thing, The Crabby Cook Cookbook is a treat. Harper has a way with words. Her stories are conversational, but don’t needlessly ramble. They’ve got their share of digressions, certainly – later on in the lasagna story she shares the bitter pleasure of imagining herself terrorizing miniaturized versions of her obnoxiously picky dinner guests trapped in her salad spinner. But they’re digressions that both feed the immediate story she’s telling and help enhance the impact of the overall book. As a result, The Crabby Cook Cookbook is genuinely fun to read. Harper’s recipes run the gamut from pumpkin breakfast muffins to “Dog-Proof Caprese Salad” (so named because it’s one of the only things Oliver, the normally omnivorous Harper family dog, would not leap to munch on even when it was left unguarded – and Harper being Harper, she explains this by way of wondering about what she’d use a device that would translate dog barks to human speech to talk to Oliver about) to the peanut butter chocolate chip cookies her daughters love. She lays out each recipe’s ingredients and cooking process cleanly and clearly, and frames them with the stories she’s acquired in her lifelong relationship with cooking, both her own and her family’s (her husband, for instance, is pretty good with burgers and brownies, and famously made a tuna melt in 1996). Harper’s stories, both good and bad, provide context for the recipes she chooses to share. But even in a world where she was just sharing her adventures in crabby cooking, she would be a pleasure to read. 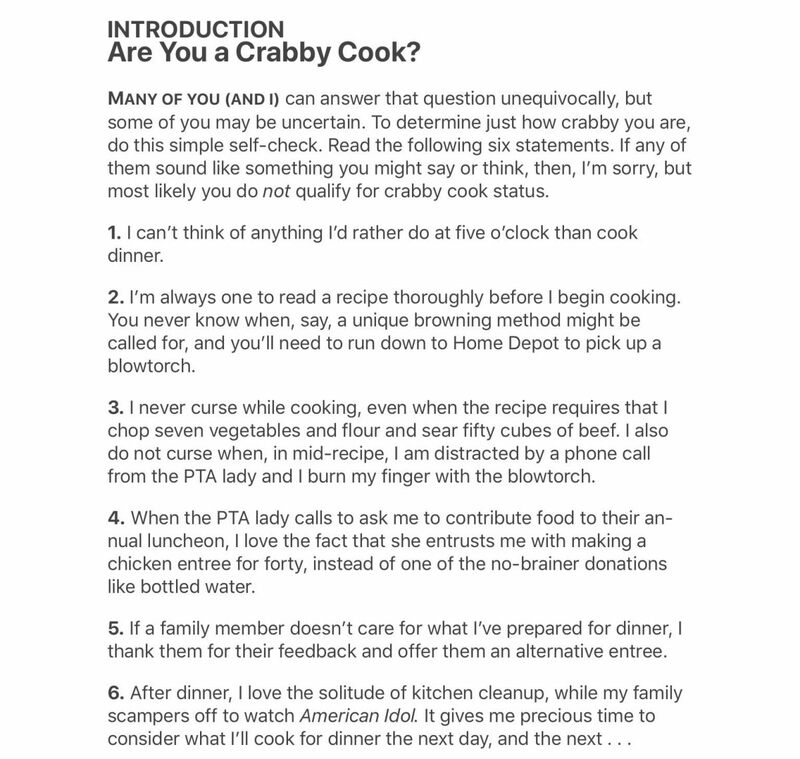 The Crabby Cook Cookbook feels like a long and winding conversation with a really neat human being. It’s a genuine treat of a book.